Talking today from Bashar al-Assad’s seat at the Arab summit in Doha, Syrian opposition leader Moaz al-Khatib said he asked Secretary of State John Kerry for U.S. forces “not to fight but to defend northern Syria” with Patriot surface-to-air missiles. Kerry “promised to consider the matter,” Khatib said without elaborating. Qatar's emir, Sheikh Hamad bin Khalifa Al Thani, opened the two-day summit by naming Khatib and Interim Prime Minister Ghassan Hitto to lead their combined team to Syria’s assigned seats at the conference. 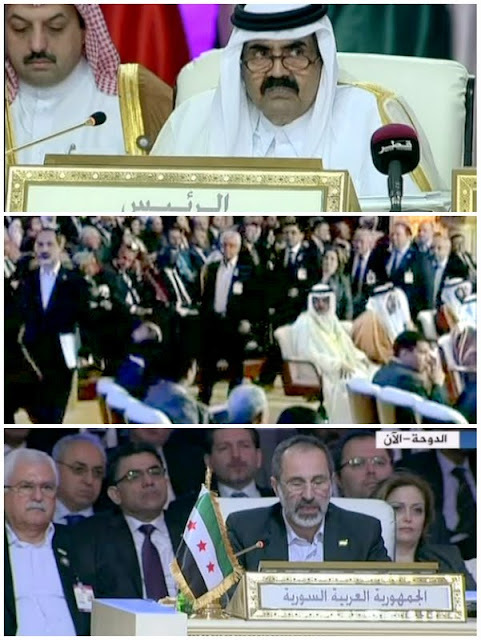 Khatib went in front and sat in what would have been Syrian President Assad’s chair before addressing the heads of state in the Syrian people’s name. His address came within an hour or so of a stirring opening speech by Sheikh Hamad in which he pledged to contribute $250 million to a US$1 billion fund for the preservation of (East) Jerusalem as a capital for the future Palestinian state. The Qatari head of state also proposed an Arab mini-summit in Cairo for the sole purpose of spawning a Palestinian reconciliation between Gaza and the West Bank. We welcome the participation of the Syrian National Coalition of Revolutionary and Opposition Forces and the Syrian Interim Government in our summit. They are undoubtedly worthy of this representation after earning popular legitimacy at home and wide support abroad, and for the reason that they have assumed a historic role in leading the revolution and preparing to build a New Syria. Grave and tragic conditions in sisterly Syria have taken a catastrophic turn over the past two years, leading to indescribable tragedies and crimes. Holding one’s tongue about these and about the suffering of the Syrian people in Syria and of the refugees in host countries is in itself a crime. -- Support Arab and international efforts and political solutions that achieve the Syrian people’s willpower and legitimate aspirations. It is unfortunate the Syrian regime chose to enter into a military confrontation with its people, turning down all appeals for serious reform and all Arab political initiatives until the catastrophe reached the stage where the much-loved Syrian people would accept nothing less than a peaceful transition of power, as endorsed by the Arab League resolution dated July 22, 2012. History will attest as to who stood by the Syrian people in their ordeal and who let them down. We reiterate our call on the UN Security Council to uphold rights and justice, and pass a resolution ordering an immediate cessation of the bloodshed in Syria and bringing to international justice those responsible for the crimes committed against its people. We renew our commitment to keep providing humanitarian assistance to the Syrian people, and urge all countries of the world to do so. We underscore the importance of convening an international conference under UN auspices for the reconstruction of Syria right after the transfer of power as willed by the Syrian people. I find it important to repeat that we are in favor of a political solution that spares peoples’ blood and lives, presuming that a solution does not put the clock back. I see the great Syria rising from the rubble soon to rebuild its glory. Ours started as a peaceful revolution, but it was met by a heartless man’s hellfire... Syrians are the only people on earth whose breadlines are bombed by warplanes. The Syrian people cannot coexist with the Assad mafia. Whereas we welcome a peace settlement, the regime rejects any solution to the Syria crisis. I suggested talking to Syrian regime representatives in return for the release of prisoners, but the regime shot down the offer. The Syrian people initiated their revolution. They alone will determine its course. Does it take years to recognize our people’s right to self-defense? Occupying Syria’s seat (at the summit) is part of the recovery of the Syrian people’s legitimate rights. We also demand regaining Syria’s seat at the United Nations and other international organizations and the repossession of Syrian (regime’s frozen) assets. Interim Prime Minister Hitto has our full confidence… We also plan to transform the Syrian National Coalition into an all-inclusive National Congress. The Syrian revolution is being undermined on three pretenses: minorities, terrorism and fear of the unknown. The pretense of minorities does not hold water. You need to ask the Lebanese about how the Syrian regime divided all Lebanese sects to rule Lebanon (for 30 years). And who killed Ghazi Kanaan (Syria’s long-time Alawite security chief in Lebanon)? Haven’t Syrian Alawites just concluded a two-day conference in Cairo, which accused the regime of working on turning sectarian zealotry into bloodshed? Regarding the pretense of terrorists being in rebel ranks, what do you call the Russians, Iranians and Hezbollah men fighting in regime ranks? And what about the regime’s two-year reign of terror? A propos fears as to who rules Syria after regime change, my answer is that Syrians alone will decide who rules them and how. It is no one else’s decision. The United States should play a bigger role in helping stop the bloodletting in Syria. I asked Mr. Kerry to extend the Patriots’ umbrella to cover the Syrian north and he promised to consider the matter. We are still waiting for a NATO decision to protect people's lives -- not to fight, but to protect lives.